How political contributions from tobacco companies and their allies tilt the playing field in the Maine Legislature. Six Mainers die every day from tobacco-related causes – 2,235 deaths annually. 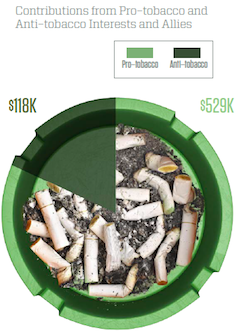 Tobacco addiction costs Maine $602 million in health care expenses each year. In addition to the devastating personal toll from myriad fatal or chronic medical conditions, smoking also causes enormous economic waste and loss of productivity. Yet smoking prevention measures continue to face serious opposition in the State House. Opponents point to the regressive nature of tobacco taxes and the impact on businesses selling these products. They argue that restrictions generate a black market in tobacco products, and encourage customers to purchase from out-of-state. In this legislative session, public health advocates have focused their smoking reduction efforts on two bills – LD 1326 and LD 1406. Final action on both bills is pending at the time of this report, but it is already clear where the battle lines are drawn. The tobacco industry and their retail partners are strongly opposed to these bills, and their passage seems highly unlikely. The outcome of this legislative debate is likely to have a significant impact on Maine for years into the future. There are strong arguments on both sides of the bills, and MCCE takes no position on the legislation. The committee of jurisdiction (Taxation) and the full legislature must weigh the arguments and the data and make a policy decision in the best interest of the people of Maine. On such a vital policy issue, however, the public deserves to know that pro-tobacco interests have been active campaign contributors for many years in Maine, helping to shape the makeup of the legislature and the outcome of such debates. 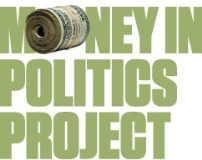 This report examines the campaign contributions to candidates, PACS, and party committees since 2000 from interests who support and oppose these bills and their allies. Contribution records show that pro-tobacco interests give far more money than the public health, medical, and non-profit organizations who support legislation such as LD 1326 and LD 1420. When special interest money plays such a major role in political campaigns, it damages the public's confidence that the legislative outcome reflects the true interests of the people.